Ideally for patios exposed to golf courses! The elegant way to guarantee privacy. For inquiries or pricing, please call or send us an email. ProTec Hurricane Solutions, Inc., based in Naples, Florida, has been selling custom made storm protection in Collier & Lee County for many, many years. 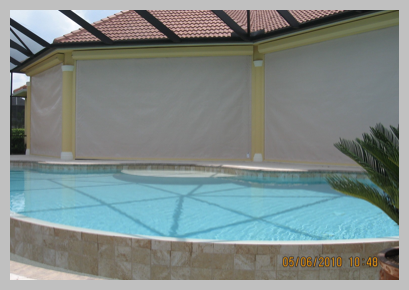 Part of our product line is the high performance ‘original’ ARMOR SCREEN, alumin. 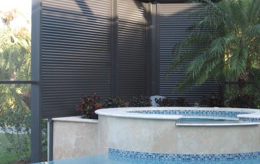 Roll Shutter, -motorized or manual, Hurricane Panels, and Accordion Shutters. Our extensive roster of consecutive satisfied customers is evidence that ProTec Hurricane Solutions, Inc. delivers sophisticated and high quality work. Be prepared, 24/7, year round! Not only during Hurricane Season. Climate change and increasing disastrous weather conditions even before and after hurricane season have clearly proven that it is imperative to have proper protection all year round. Technology is available to do just that with minimal effort. Have peace in mind, while in or out of town. Don’t rely on your insurance only! Because, items with sentimental value, is something insurance cannot replace!! IS ONLY ONE PHONE CALL AWAY!